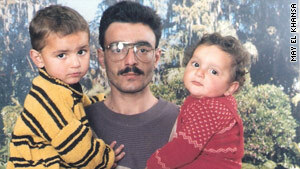 Ali Hussain Sibat pictured with two of his five children. (CNN) -- Amnesty International is calling on Saudi Arabia's King Abdullah to stop the execution of a Lebanese man sentenced to death for "sorcery." In a statement released Thursday, the international rights group condemned the verdict and demanded the immediate release of Ali Hussain Sibat, former host of a popular call-in show that aired on Sheherazade, a Beirut based satellite TV channel. According to his lawyer, Sibat, who is 48 and has five children, would predict the future on his show and give out advice to his audience. The attorney, May El Khansa, who is in Lebanon, tells CNN her client was arrested by Saudi Arabia's religious police (known as the Mutawa'een) and charged with sorcery while visiting the country in May 2008. Sibat was in Saudi Arabia to perform the Islamic religious pilgrimage known as Umra. Sibat was then put on trial. In November 2009, a court in the Saudi city of Medina found Sibat guilty and sentenced him to death. According to El Khansa, Sibat appealed the verdict. The case was taken up by the Court of Appeal in the Saudi city of Mecca on the grounds that the initial verdict was "premature." El Khansa tells CNN that the Mecca appeals court then sent the case back to the original court for reconsideration, stipulating that all charges made against Sibat needed to be verified and that he should be given a chance to repent. On March 10, judges in Medina upheld their initial verdict, meaning Sibat is once again sentenced to be executed. "The Medina court refused the sentence of the appeals court," said El Khansa, adding her client will appeal the verdict once more. Sibat's wife, Samira Rahmoon told CNN she has not seen her husband and has no idea of his health. "I haven't seen my husband in two years. I don't know if he's eating. I don't know if he's healthy. I don't know how he looks. This has been very difficult. I don't even have enough money to be able to travel to Saudi Arabia to see him," she said. "I don't have anything against the Saudi government. I just want to see my husband again." The case has been covered extensively by local media. According to Arab News, an English language Saudi daily newspaper, after the most recent verdict was issued, the judges in Medina issued a statement expressing that Sibat deserved to be executed for having continually practiced black magic on his show, adding that this sentence would deter others from practicing sorcery. Arab News reports that the case will now return to the appeals court in Mecca. CNN has not been able to reach Saudi Arabia's Ministry of Justice for comment.